Prague was awarded the prestigious UNESCO City of Literature title, which UNESCO grants to cities of the world for the special place literature occupies in their life. Only seven cities became recipients of this designation in 2004, when the title was first awarded. They were Edinburgh (UK), Melbourne (Australia), Iowa City (USA), Dublin (Ireland), Reykjavik (Iceland), Norwich (UK) and Krakow (Poland). In December 2014, joined also Dunedin (New Zealand), Heidelberg (Germany) and Granada (Spain). Irina Bokova, Director-General of UNESCO, on December 1, 2014, declared Prague as the new Member of UNESCO Creative Cities of Literature. Entering Prague in the list of the cities holding the distinguished City of Literature title means admitting Prague into the elite company of the Cities of Literature of the world. In December 2015 UNESCO Director-General, Irina Bokova, announced the designation of 8 cities as new members of the UNESCO Creative Cities Network: Baghdad (Iraq): , Barcelona (Spain), Ljubljana (Slovenia), Lviv (Ukraine), Montevideo (Uruguay), Óbidos (Portugal), Tartu (Estonia), Ulyanovsk (Russian Federation) and Nottingham (United Kingdom of Great Britain and Northern Ireland). 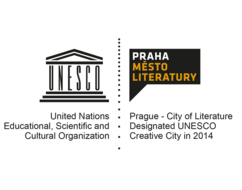 The UNESCO Creative Cities of Literature Network has grown up to the current 20 members. This initiative indeed came from the institutions and individual representatives of Prague literary life. Today, over 30 largest Prague literary organisations are taking part in this programme, which has turned into a large-scale international project. Now the initiative facilitates more effective coordination and planning of joint actions in order to share experiences and support each other. The project has become a historical platform for the cooperation of authors, publishers, literary critics, librarians and other participants in Prague literary life. A city designated as Creative City of Literature must have a sufficient number of institutions taking care of high level of its literary life and promoting literature. Literature is supposed to play an essential part in the city’s life and be given a significant support. The city should have the ability and experience to organise different kinds of literary events, and an appropriate level of literary education should be provided along with quality, quantity and diversity of literary activities. The project’s initiators are Czech Centres and the Municipal Library of Prague project was supported in 2010 by the Prague City Council resolution. The Municipal Library of Prague was appointed project coordinator. The project currently involves more than 30 partners, who are engaged in various aspects of books and literature – copyright associations and unions, editors, publishers, libraries, trade fairs, festivals, literary awards and literary newspaper.